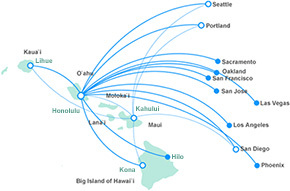 Hilo (ITO) International Airport is located about two miles east of the Hawaiian city of Hilo. This is the east-side airport terminal for The Big Island, also known as Hawaii. Expect the scenery to be tropical rainforest lush from frequent rains. Getting to your rental vehicle is a snap. After you’ve retrieved your luggage at Baggage Claim, cross Kekuanaoa Ave. outside the terminal to locate your rental vehicle from the companies before you.